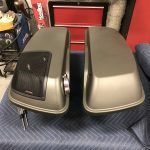 Given the popularity of motorcycle audio upgrades here at The Audio Garage in Fargo, we decided it was to time to put together a Harley-Davidson Street Glide audio system to use for demonstration purposes. 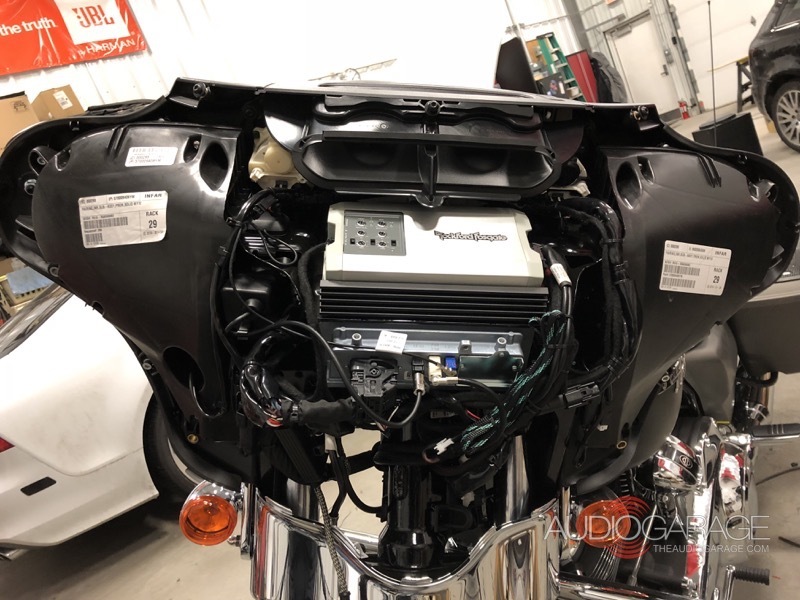 The 2018 Street Glide you see here will live at the store so that clients can listen to the Rockford Fosgate HD14-TKIT and TMS69BL14 in a real-world application. The bag lids are taped and the template (in black) is used to mark where the hole is cut. The installed grilles look like a factory solution. 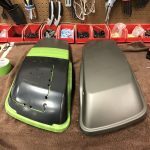 We started this project by removing the fairing cover and the factory speaker enclosures. We replaced the factory speakers with the 6.5-inch TMS65 Power-Series speakers from the HD14-TKIT. The speakers mount without the need for any modifications. The TMS69BL14 rear speaker kit is hands-down the best solution in the industry for adding rear speakers to a late-model Harley. The system includes a pair of TMS69 Element Ready 6x9s, a set of grilles and mounting hardware and a cutout template for the bag lids. Unlike other bag lid solutions, the Rockford kit repurposes the factory bag lids to eliminate the need for color matching or painting. After masking off the lids with 3M tape, we applied the template, traced the cutting path then carefully removed a section of the lid. The integrated mounting hardware and grille sandwich around the lid and provide a clean look and perfect fit and finish. The small size of the Rockford Fosgate amplifier allowed it to fit above the factory radio. The next step was to install the Power-Series TM400X4ad four-channel amplifier above the factory radio on the Street Glide. Rockford includes its RFKHD mounting kit for 1998 and newer Harleys. All the brackets, fasteners and wiring we need are cut to length and terminated properly to make the installation efficient. The TM400X4ad amplifier is capable of producing 100 watts from each of its four channels to ensure our clients have enough power to listen to music at volume levels that will drown out wind and exhaust noise. The new amp connects directly to the factory radio without the need for any additional adapters or interfaces. Upgrade Your Harley-Davidson Street Glide Audio System Today! Our fabrication team modified this headlight to work with our Street Glide. 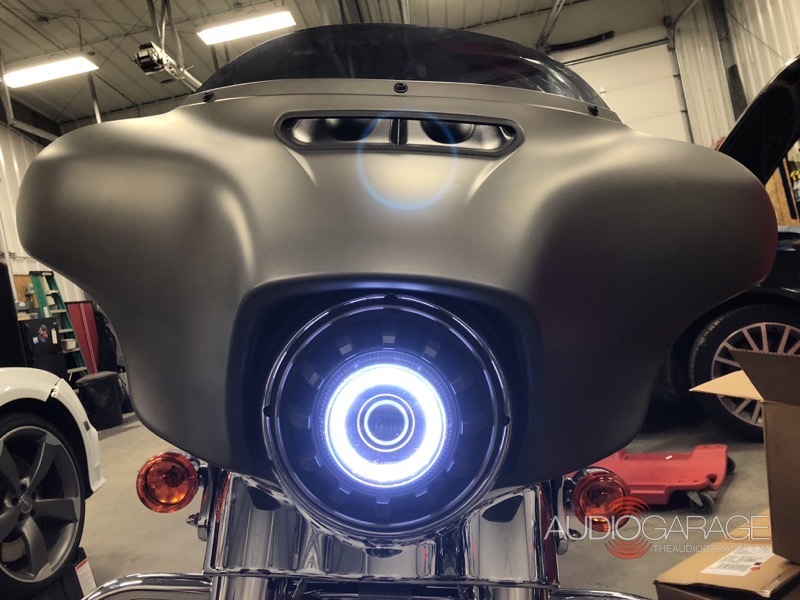 We finished our Harley-Davidson Street Glide audio upgrade project by building a custom headlight using a Morimoto Super7 LED housing and a matching RGB halo ring. 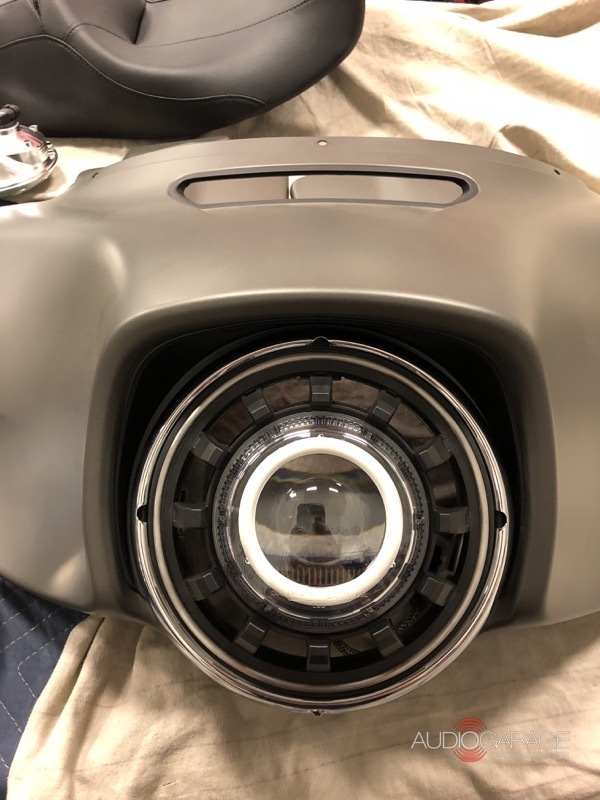 The headlight looks a bit like Tony Stark’s Arc Reactor – totally cool! With the radio reflashed and the audio system dialed in, our clients can now experience the Rockford System in a setting nearly identical to theirs. If you are in the Fargo area and are interested in upgrading the audio system on your motorcycle, drop by The Audio Garage and have a listen to our 2018 Street Glide We think you’ll be impressed. If you have any questions, give us a call or send an e-mail using our contact page.